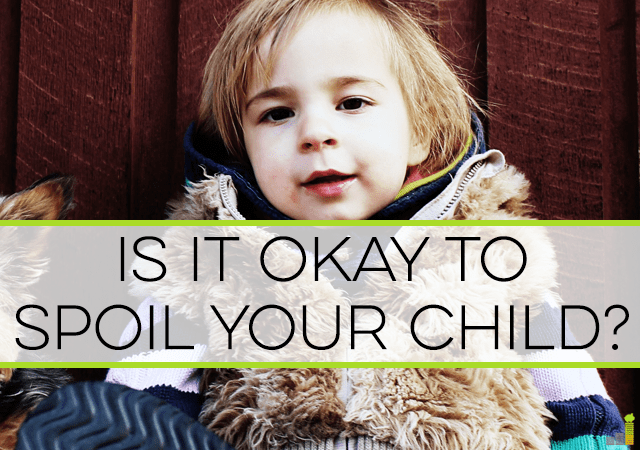 Is It Okay to Spoil Your Child? A couple of years ago, my neighbor had a small party for her young son’s birthday. A friend of his, who was about 12 years old, walked up and asked my neighbor what her son had gotten from his parents for his birthday. When my neighbor told her that his gift had been a Lego set, the girl then asked, “Okay, so what was his big present?” Although that little girl is a great kid otherwise, her question was an unfortunate reminder of the expectations we set when we spoil our children through an abundance of toys and excessive gift-giving. Is It Okay to Spoil Kids? The desire to spoil our kids is strong. We want to buy our kids everything they want, and if you step into any toy store, it’s easy to go down that road. Every birthday and Christmas, many parents feel like they have to outdo the year before and so on, until their kids’ expectations are set ridiculously high. But is it okay to spoil children with everything they want or will doing so simply set them up for a lifetime of high expectations and disappointment? Rather than spoiling our kids with mountains of toys, we should spoil them in constructive ways that will help them grow into interesting, appreciative adults. Thinking back to my own childhood, which was wonderful in so many ways, I do remember having big Christmases with piles of presents under the tree. What I don’t remember is what all of those specific presents were, and I have exactly zero of them today. They weren’t important enough to me to keep into adulthood. What I do remember from my childhood and what I still carry with me today are the memories from all of the fun experiences I had with my family. We hiked endless trails, creeks, and ridges for free. We played games outside and still play kickball as a family to this day. We also went on frugal vacations once a year to exotic locales like Michigan and Niagara Falls. I joke about vacationing to Michigan, but the point is that it didn’t really matter where we were going. We were together as a family and, as a kid, that’s all that mattered. We were on an adventure! Even though we couldn’t afford a trip to Paris or Hawaii, we had a ball on each and every vacation we took, and I loved that we got to plan a new one every year. Each vacation was an exciting new adventure, no matter how close to home we actually were, and that’s the kind of childhood I want to recreate for my own daughter. Since the day she was born, I’ve been working hard to spoil my daughter with real experiences that she can carry with her through the rest of her life, like the ones I had as a child. Rather than spending hundreds of dollars on new toys each year for Christmas and her birthday, we make it a priority to explore new places like parks, museums, aquariums, and zoos, and we have fun together as a family. We are also continuing the tradition of taking an annual family vacation, even though that means going somewhere within a day’s driving distance of our home instead of hopping on a plane. We are creating our own family memories that will bond us for the rest of our lives without spending a ton of dough to do it. In addition to fun family experiences, the one thing our kids want more than anything is our time. They spend all day away from us at daycare or school, then they have to wait a few hours for us to get home from work, and then do homework, extracurricular activities, take baths and eat dinner before an early bedtime. It sometimes doesn’t leave a lot of time to spend together doing something fun. That’s why they always want our attention. Even when our kids get new toys that are intended to occupy their time, they still want our attention. When they get a new bike, they want us to watch them ride it. When they get a new dollhouse, they want us to play pretend with them. I sometimes catch myself getting aggravated when my 4 year-old wants to play “school” for the twentieth time that week, but I sometimes have to remind myself to be grateful for that. What a special thing it is for someone to crave our attention! Our kids want our attention, so we should spoil them with it as much as we can. If that means putting down our work or phones or turning off the TV then that’s a worthy trade-off. That stuff can wait, but our kids are getting older by the day and once they are grown, they will no longer crave so much of our time. We will be craving theirs by then, so we’ve got to enjoy spoiling them with our time, attention, and love while the time is ripe. 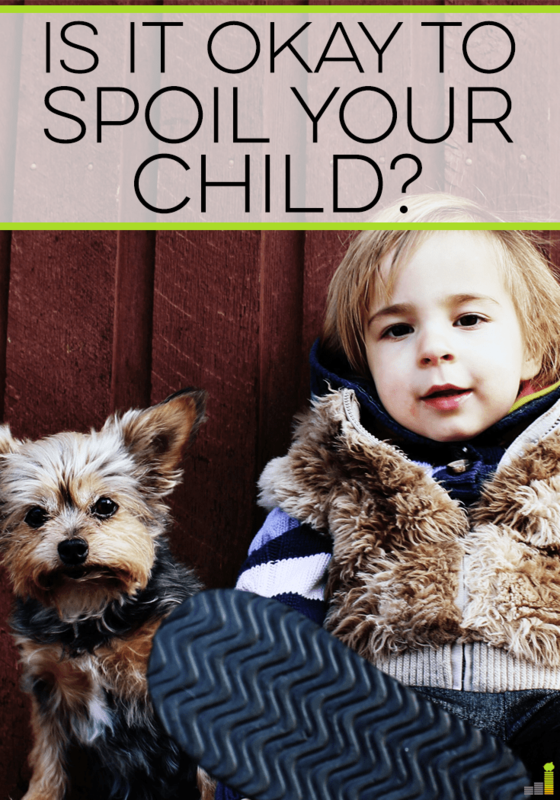 Do you think it’s okay to spoil your children? Were you spoiled as a child? How are you trying to make sure your kids aren’t spoiled? Robin is a freelance writer who chronicles her financial missteps and victories on her blog www.TheThriftyPeach.com. While the article focuses on too many toys, I think a parent can actually spoil a child in other ways that could be more harmful. Like allowing too many extra curricular activities that the kid can’t learn to make a commitment to one or two important ones. Or as the helicopter parents are accused of doing, which is shielding their child from any disappointment. Such as swooping in to confront a teacher because the child received a deserved bad grade. In that case, the child never learns to fail and has a completely unrealistic expectation of life’s battles. Never making the kid work whether at a job or with duties in the home is one more way of spoiling them because they have no knowledge of how to work or where money actually comes from. Having too many toys gets a bad rap, somewhat in the same vein as the “experiences not things” movement promoted for adults. I agree, Kathy. Although I focused on having too many toys, there are certainly other ways that kids can become too spoiled, which can be detrimental to their futures. My daughter is spoiled mostly because she is an only child and doesn’t have to share attention. I’m not sure there is a way around it but I do try to be honest and not shield her from good or bad. She will also have to “earn her keep” by doing chores and getting a part time job when the time comes. I see so many kids who have been sheltered from the real world who never develop a work ethic. Then Mom and Dad are surprised when they never want to leave home. It’s great to want your kids to have more than you did but teach them to earn it. Don’t hand it to them. I was an only child and I know I was spoiled to a certain degree, but my parents also made sure that I worked and understood good values and appreciated what I had. We pass those values along to our kids now. We do a lot of camping (in Michigan, ironically enough *lol*) and our big reason is to give the memories that we hope they’ll carry and that will make them appreciate our family as they grow older. We always spoiled our kids with love and attention. Our goal was to create as many memories with them and us as possible. Of course, we bought them gifts, but never an abundance as we wanted them to be appreciative of what they have. My in-laws always enjoyed taking the kids out because they never asked for anything from the store. They just had fun being with grandma and grandpa. They never asked for anything from the store– that is seriously impressive! It’ll be tough. Heck, I want to buy my husband everything he wants (until I look at our goals, anyway). I think spoiling a kid up to a point is okay. I tell people I was spoiled because I generally got everything I wanted. (My mom counters that I was “indulged.”) I guess the difference is that I was made aware that certain trade-offs were in play. When I was 16, I asked for a $50 ring for Christmas. Mom said it’d be one of my only presents, and I said I’d expected that. Even so, I remember being aware on Christmas that she got me too much considering that conversation. Granted, she was a bargain shopper, but the point is that I got pretty much anything I wanted. I was just made aware that there were financial considerations that went into “indulging” me. I think experiences are a good thing to a certain extent. While I don’t know anyone who doesn’t want their kid to travel and have those experiences growing up, I think sometimes kids can become entitled through the amount of travel and experiences they have. Some people I know clearly feel entitled to traveling the world, and usually it’s funded by their parents. It is definitely not OK to spoil kids but the fact is, people who do spoil their kids with excessive gifts and gadgets, do not realize the harm they’re doing. In their own minds, they’re just being generous parents. I fully agree kids should be showered with love and affection and most of all, time!! Kids in our family do get lots of present from relatives, but many of their requests are rationally turned down too. Time and attention is so important, especially now that we’ve got so many screens demanding our attention 24/7. It’s scary to think about what our kids will deal with when they’re adults. Yes definitely. It’s fine to spoil kids sometimes, but we have to draw a line and make sure that they are properly guided and receive advice or what is best for them so they grow up with right attitude.